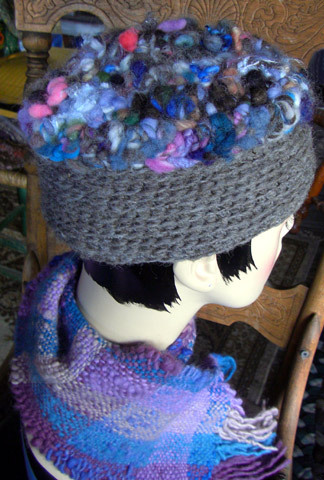 The top of this hat is made from extra bulky, lumpy spun Corriedale and Shetland wool, silk, and mohair, and the gray band is medium weight undyed Jacob wool. I call it a 'pill box' style, and it covers about half of the ears. 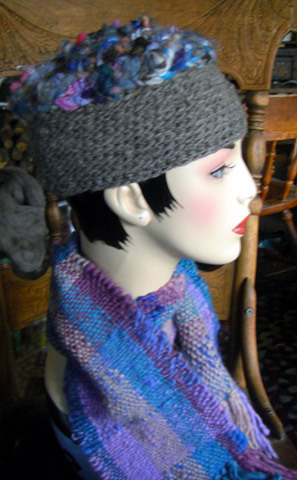 The scarf is all Corriedale wool and I wove it on a small heddle loom. I started making some woven scarves about a year ago, but have mostly done them as custom orders only. 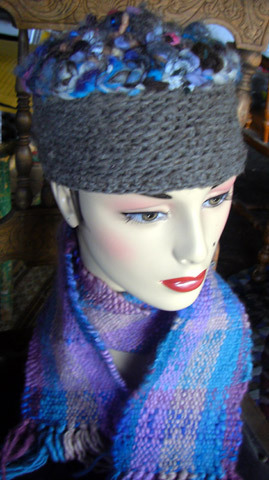 This one is about 4 feet long and works well for a neck warmer under a coat or jacket. It's 6 inches wide. * Note: Many people confuse spinning with weaving, and I'm often asked if my spinning wheel is a loom. Spinning involves making yarn on a spinning wheel, while weaving is done on a loom. Looms come in a wide variety of sizes from huge ones for making rugs to small, portable ones like the one I used to make this scarf, which is small enough to set up on a table and is used primarily for making scarves.